One of the most frustrating things that we can encounter while camping is a poor, unstable WiFi connection. For this reason, we sometimes find ourselves stressed because we cannot stay connected to the world, check our emails and do business online. That is why it’s wise to invest on the best WiFi booster for RV. This device is essential for the RVing lifestyle because it boosts existing WiFi network connection as well as locate even far away and weak signals, and then boost them for a better reception. However, we simply just cannot buy any WiFi extender that pops up on searches because they’re not all the same regarding performance and quality. So today, we’d like to shed some light and help you select from a myriad of options available based on the factors we’ve also highlighted in the later section of this guide. If you’re ready, let’s begin and help you select the right WiFi booster for you. 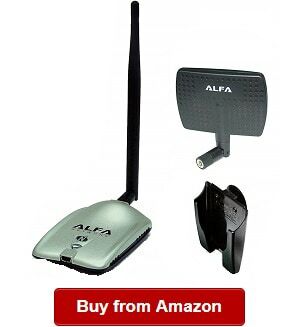 If you’re shopping around for the best RV WiFi antenna, you should not miss the Alfa Wi-Fi Camp Pro 2! It has compact and solid features that make it an ideal choice for RV owners that want to get a strong internet connection in their recreational vehicle. This product is from a trusted brand, the Alfa Network. 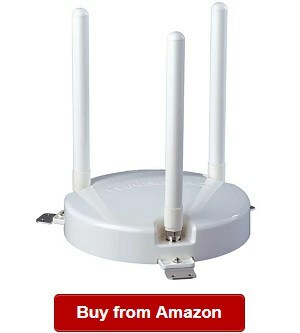 This Wi-Fi antenna is a worthwhile choice if you’re looking for a good Wi-Fi booster for its long-range ability. You can rely on it for its versatility as well because it can be used in a boat or a yacht. So whenever you are out camping on your marine vehicle or recreational vehicle, you can depend on the Wi-Fi antenna that works just as perfectly. The use of the kit can boost the signal you’ll receive in your RV. It can deliver a strong connection signal coming from a hotspot. The Camp Pro 2 is running using a USB, so it can be connected conveniently to your computer. 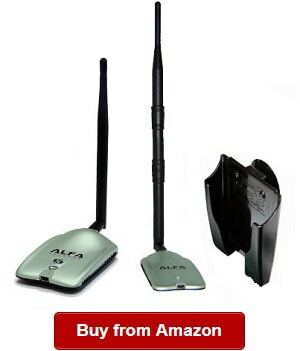 The Alfa Camp Pro 2 also has the ability of picking up a weak connection for its long-range capability. I also recommend this product because it can also function as a WiFi-as-WAN receiver if you’re going to use it with a USB repeater. With that functionality, it can also work as a router that can produce local networks. And when that happens, you can connect several devices to it, meaning many of your loved ones can connect at the same time. This model also includes a 9-dBi outdoor WiFi antenna, which comes in a fiberglass. The antenna is an excellent one for its high sensitivity. On the negative note, the instruction coming with it is a bit complex to understand. 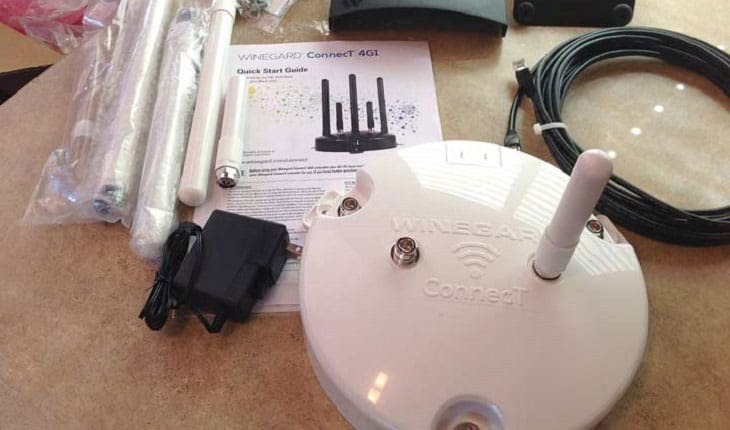 Are you looking for WiFi signal booster for RV, you should not miss this Wi-Fi extender antenna that works like no other when it comes to supplying our RV with a strong internet connection and picking up even weak signals for its long range capability. I would also like to recommend this product because it can solve the common problem of RV owners when it comes to gaining stronger and more reliable connections. Even weak signals can be picked up and converted to robust connection, helping us have a more pleasurable time in our RV by being connected online anywhere we are. The BearExtender WiFi extender is one of the best to use for marine and outdoor use. This product is also designed for the Windows PC. Another thing I like about the WiFi extender is the ability to combine 10dBi high gain directional antenna and excellent amplifier. I also like that it has a good enclosure to protect it from harsh weather and outdoor elements. You will also appreciate that it can resist both water and dust for long lasting use. I also like that this Wi-Fi signal booster will not give users a hard time to setting it up. You can easily do it using a Velcro strap, which already comes in the kit. The product also comes with a pole-mounting band and a 16ft USB, making it possible to install it away from your computer. I would also like to note that it already comes with a powerful 10-dBi directional antenna, acquiring much power using only one direction. You can also use this kit, in your not only boat and RV and home. On a negative note, this product is not compatible for use with an iOS, android, Mac OS and Windows RT tablet. When it comes to choosing the RV WiFi range extender, you should not miss the Alfa AWUS036NH. It is a long-range Wi-Fi signal booster. This product also boasts its RP-SMA antenna connector, allowing you to use it in using an external antenna. With that, you can boost the signal of your internet connection. I also love this model that offers an explosive output of 2000mw, making it an ideal choice if you’re looking for a booster that can you can connect to your 2.4 GHz outdoor antenna in a boat or an RV. If you’re looking for a stronger WiFi plus an extended range, you can choose the ALFA 802.11g wireless USB adapter that already includes an RP-SMA antenna connector, which you can use when trying to add an outdoor antenna that can boost the signal and wireless range. The product already comes with dBi-gain rubber duck antenna, which makes it an even ideal choice. The model is also lightweight for being only less than two ounces. With that said, it is also very convenient to install and take on any outdoor adventure and trip. You can also rely on it because it is meant for use as a USB adapter, making it a good choice for being suitable with a PC that has a port for the USB. The WiFi network adapter also features robust security level for its encryption ability. That said you could be certain that you will have a safe and secure connection. I also love the LED indicator that makes it more convenient to use. You will also love the product that can boast a maximum speed of 150 mbps signal connection as well as high-speed TX transfer data rate. On a negative note, this product’s USB port feels a bit flimsy. Stay connected to the world even while camping. 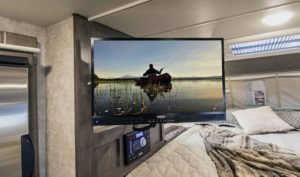 Check out this WiFi for RV travelers, offering supreme and strong connections and speeds reaching up to 1200Mbps. I love this WiFi range extender because it is versatile enough for many applications. It is a 3-in-1 extender and booster that are perfect for extending the WiFi capability of different devices, such as an iPad, iPhone and android. It can also be used in extending the WiFi capability of other devices, such as Samsung, PC, Mac, multimedia player and Smart TV. This time around, there won’t be dead zones again because of its Powerline Ethernet. It also comes with four pieces of 5DBi external Antennas with the ability of extending Wi-Fi signal coming from your router. It can also get rid of dead spots and boost your current signal. I love that the best WiFi for RV parks is also one of the best in dual band technology. With that, you can be certain of fast internet speeds reaching up to 1167Mbps. This model also comes with amplifiers that can provide supreme internet penetration and coverage. If you’re looking for a smooth and fast signal connection, you should not miss the booster that you can use with your different devices, including Smart Plug, Mac, PC and multimedia player. With this model, there will be no dead zone again wherever you are. You can also choose from different modes available, including an AP mode, repeater mode and router mode. I love its repeater mode extending the coverage of the WiFi of a current wireless network. The 2.4 GHz antenna router mode is ideal when trying to create a private wireless network and allowing different devices to use and share the booster. I believe you will also love the AP mode, which proves perfect if you want to make a private wireless network. On the downside, it can be a bit complex to set up. The EX2700 is one powerful long range WiFi repeater kit for RVs, so I believe it must be included in this review of the best WiFi repeaters for recreational vehicles. You can choose it for extending the signal you’re getting from devices, including a PlayStation 3, iPad 2, Samsung Galaxy S3 and iPhone 5, to name some. This WiFi extender can extend the signal for up to 300Mbps and also offers a strong band with 2.4 GHz. The extender can help in optimizing your home network, monitoring signal strength and checking for network status. This product can also identify available channels without suffering from interference and traffic. It can also work with any standard Gateway and router, so you can depend on its versatility and functionality. I also recommend this WiFi extender because it comes with external antennas that can improve coverage and enhance performance. 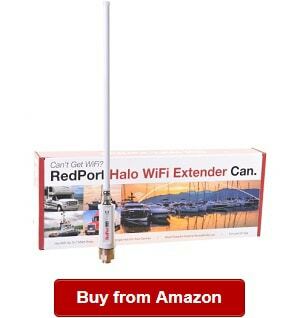 You can also rely on this product for the excellent WiFi signal that it can deliver even when you’re parked in a remote location. It also has the ability of improving signals even in hard-to-reach places. So if you’re looking to achieve a better internet connection, you should use the booster and take advantage of its excellent performance. This model is one of the best RV WiFi systems that you can rely on if you’re looking for top speed mobile internet connection. This system can improve and double the speed of your existing connection. Thanks to its external antennas to help in extending the coverage of your Wi-Fi throughout large backyards and homes. On the downside, the installation can be a bit complex for first timers. The Marine & RV extender system is one of the excellent choices when it comes to RV park WiFi systems, and it is one of those that I would like to recommend to you. I like that the system is able to pick up WiFi connection in your marina or RV even if your recreational vehicle is parked far away, but then you have to be in a location with a good weather condition, for instance. It can also pick up even weak signals that it can also boost and strengthen for a better coverage. By choosing this product, you can also have peace of mind that you can connect multiple gadgets and still get good Wi-Fi connection on them. This time around, you can simultaneously connect your tablets, computers and cell phones at once. You will also love that it comes with a stainless steel connector, which makes the booster easy to mount in your boat or RV. I also recommend it because it is made of high quality and durable marine-grade components. It only means that you can look forward to long-term use of this WiFi booster This one is also dependable for its ability of dealing with tough outdoor conditions, including a bad weather and temperature changes. In that case, you can rely on it whether you’re going to use it for a week or so aboard the marine or a recreational vehicle. In addition, this product is perfect when it comes to optimizing the hotspot for its WiFi hotspot optimizer. I also like that the Halo Long Range WiFi Extender System is its versatility and compatibility for a wide range of devices, such as Smart TV, PC, tablet and cell phone. For this reason, it is one of the most reliable and robust systems around when it comes to long-range WiFi signal boosting for the outdoors. On the downside, it is a bit expensive. 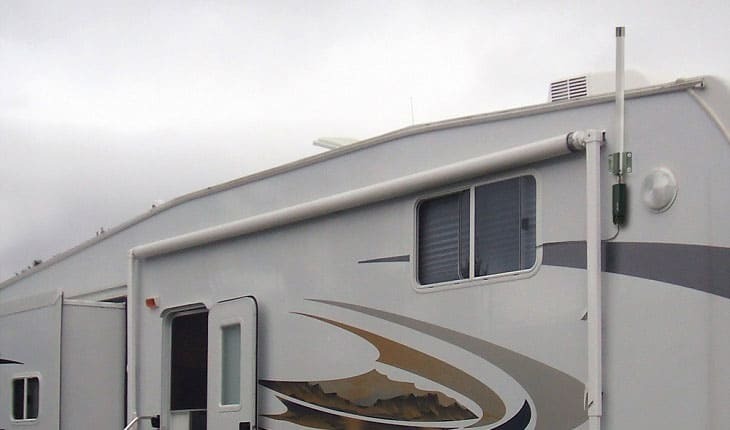 The WiFi antenna for motorhome is one of those boosters I would like to recommend to you because it can connect to the router for up to 400 feet away. You can rely on the CC Vector if you’re looking to extend your Wi-Fi coverage and connect multiple devices at once. 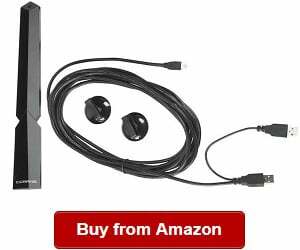 It works compatibly to connect most devices, including tablets, Smartphones, Smart TV and PCs. This kit is a great choice for its ability of repeating signal to multiple devices, as we’ve mentioned above. It works perfectly for big rigs, homes, boats and other outdoor locations. Even if you’re RV is parked far away from a hotspot, this booster can find and connect to public WiFi connection that can be as far as 400 feet away. Another thing I notice with the CC Vector RV WiFi Repeater System is its excellent ability in connecting long-range even for large homes. It can also work compatibly with multiple systems, including Apple and Windows. I would also like to emphasize the available jacks, allowing you to connect additional routers and computers. This product is also making use of an ideal band reaching at 2.4 GHz. You don’t also have to worry about the installation process because it is easy to set up even by anyone. Another thing I love about the CC Vector RV is its ability of supporting two people who are watching videos. It can also support multiple users who are browsing the internet at the same time. Overall, the RV WiFi antenna and repeater is perfect for those who want to extend their WiFi signal range when camping. You can rely on it even when your RV is parked in a far away location from the public WiFi. However, take note that the speed can be a problem the farther you are from it. Rely on the powerful performance of this network adapter that is all you need if you want to extend and boost your WiFi connection in the recreational vehicle or camper. It is also for you if you are looking to get great WiFi signal reception while on the camping ground or on your boat. The RV WiFi antenna receiver is one of the strongest models on the market now for its ability of using and combining a high-gain +9 dBi antenna and powerful WiFi adapters. One thing I love about it its capability of reaching a distance of up to 1.2 mile or 2 km. I also would like to recommend the best WiFi antenna for RV because of its compatibility for many devices, including tablets, desktops, laptops, Smartphones and Smart TV, to name some. This product is also one of the best around because it comes complete with the things you will need to install or set it up. I love that it also comes with two antennas that can enhance the coverage and performance of the connection. One of the antennas is the mini 5 dBi portable or travel antenna, and another one is the 9dBI antenna at 2.4 GHz. I also would like to recommend it because it is perfect for traveling and camping because it is also lightweight at only two ounces and compact with dimensions only 8.5 x 6.3cm or 3.5 x 2.5 inches. So if you want to always stay connected to the world, check your emails, post on social media and do what you love online, you might want to look into the WiFi booster that works efficiently and effectively in extending and boosting the signal. On a negative note, it isn’t so clear and bright LED indicator. If you’re looking to improve your mobile internet service for RV, you might want to consider the C. Crane US3 Super USB WiFi Antenna 3. It is one of the latest innovations from the brand, which is known for its commitment and desire to deliver satisfying products to their consumers. One of the things I notice about the C. Crane US3 is its ability of significantly improving the WiFi signal in the recreational vehicle, marine or yacht. So when it comes to staying connected to the world even while camping, having this device onboard might be what you need. This product also has a water-resistant and weather-resistant design that makes it suitable for use outdoors. It can deal with extreme weather and temperature changes, ensuring you can use it for a long time without worrying about any repairs needed. It also offers a supreme performance while also being very easy to install. One of the things I also love about it is that it includes different mounting options. This model also comes with a USB split cable. The booster is also one of the best around for its ease of use feature that it can be easily plugged into the PC for a great internet reception. You will also love that the WiFi RV booster offers you an outstanding performance all the time. I can also day that it is pretty much powerful, allowing you to connect it to a small Wirele4ss router even when you’re 100 yards away. At this distance, the booster can keep 80 percent signal even with several obstructions and walls. However, it can be complicated to set up at first. 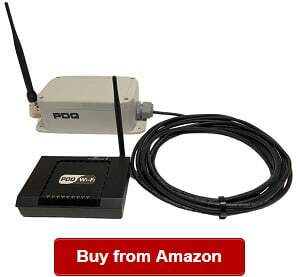 The PDQ 7010RV-GE N2 WiFi Amplifier is one of the RV WiFi repeaters extenders that I found online. It is ideal for use in campers, boats, motorhomes and recreational vehicles. What I love about it is its long-range capability of locating WiFi signals even the weakest ones and then boosting their reception. When aboard the recreational vehicle and looking to improve signal reception, the PDQ 7010RV-GE N2 is a reliable choice. With it, you can connect multiple devices, including phones, tablets and Smart TVs, among others. 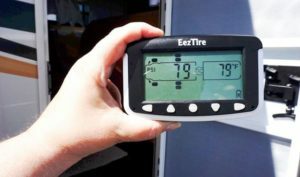 It is also easy to set up, so you don’t have to worry about installing it for your RV or travel trailer. The ease of installation is one of the things you will appreciate about this booster. Even if you don’t have much experience in using a WiFi extender like it, you can have peace of mind that this device won’t give you a hard time. This kit comes with a four-port wireless router, which can let you connect any WiFi enabled device to it. This product is also made with durable materials, which make it effective in dealing with harsh weather conditions. It is specifically made for outdoor use. I also love that it can improve the coverage of the WiFi signal of an existing one. As it is also able to find hotspots even when your vehicle is parked far away from it, it can give your family members a convenient way of connecting online, browsing websites and watching videos with ease. On the downside, it can be a bit flimsy, though. Are you looking for good WiFi equipment for RV parks? 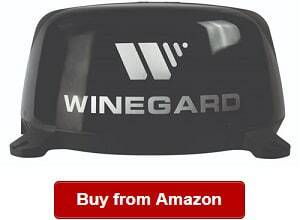 If so, you might want to consider the Winegard WF-4000. The booster can provide secure and safe WiFi connection onboard, so you can have peace of mind that you and your loved ones can browse online and watch movies without any hassles online. The RV Wi-Fi is also perfect for providing you with 4G LTE for high-speed connection. It lets you connect and take advantage of the speed of the internet. 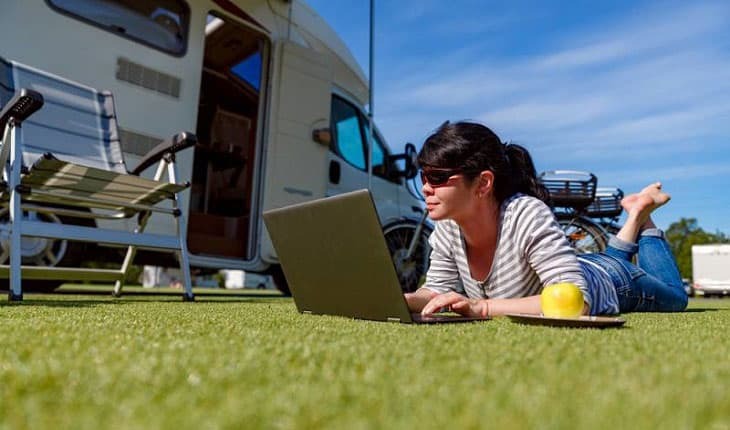 The Wi-Fi Extender is what you need for an excellent connection while parked on the campsite or traveling with your recreational vehicle. This RV park WiFi booster for my RV is what you need for its high performance antennas that extend the coverage range and its powerful signal amplifier. I also like that it is ready to support multiple users because it is memo-ready that improves performance even they’re connected to the WiFi at the same time. 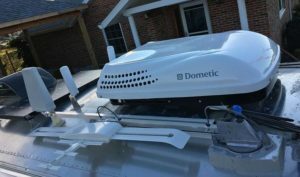 This booster can offer a fast nationwide 4GLTE coverage that allows for in-motion connection and uninterrupted coverage when traveling with your camper. However, you need to get the 4G LTE data plan of the brand to make use of this feature. This unit also has a good dome design, which is proven tested to keep up with the huge demands of a mobile setup. This amplifier also comes with an easy to follow and understand instruction manual for easy setup. On the downside, this unit is not supporting SIM card swapping. If you’re shopping around for a WiFi repeater kit for RVs, you can also consider adding this product to your comparison list and selection process. This WiFi booster is from Winegard, one of the most known names in the industry for high quality signal and antenna equipment. This Wi-Fi Extender for RVs lets you enjoy faster speeds from networks in your vehicle. it can also deliver an increased signal range. The Winegard Connect 2.0 WF2 (WF2-335) also prevents dead zones, but instead, it can increase the number of entertainment and internet zones aboard your recreational vehicle. This kit comes with powerful WiFi antennas that can enhance transmission range, letting you and your loved ones capture signals even from far hotspots at the truck stops and campgrounds. If you’re looking to have secure internet connection onboard, you can also rely on the booster because of its Advanced WiFi protected access that can ensure browsing online will be safe and secure. Definitely, the RV WiFi range booster amplifier is what you need for that peace of mind. Another thing I like about the Winegard Connect 2.0 WF2 (WF2-335) is its low profile dome design, allowing for an easy setting up. This design is also suitable for outdoor conditions and harsh weather elements. This product is also backed by the two-year parts warranty and one-year labor warranty. On the downside, the instructions can be quite unclear. You should trust us because we didn’t just simply review the products featured in today’s guide. Instead, we’ve carefully researched, compared and determined which among the plentiful of choices can provide us with the most valuable investment. For this reason, we’ve listed certain factors to consider and from there we have looked for WiFi boosters that meet standards for a truthful review. Smart RVing also envisions becoming your one-stop source of valuable and trustworthy product reviews and information content for all thing recreational vehicle lifestyle. We’ve been around for years and since then have been RV enthusiasts ourselves. For this reason, we have also encountered and used RV products and accessories, so we have firsthand experience on what makes good WiFi boosters on the market. We do hope you picked up something from this guide to buy the right WiFi signal booster for your RV. But if you have more questions, our team is ready and willing to help. Contact us anytime. The WiFi extender, repeater or booster for the recreational vehicle is an innovative device specifically meant for mobile use. While on the go and camping, you can rely on the device to receive signals even from connections located yards or even kilometers away. That said you don’t have to worry about not being able to connect with your loved ones, business partners and friends while camping with your camper or travel trailer. It works by extending the coverage area of an existing WiFi network by doubling it and improving its speed. 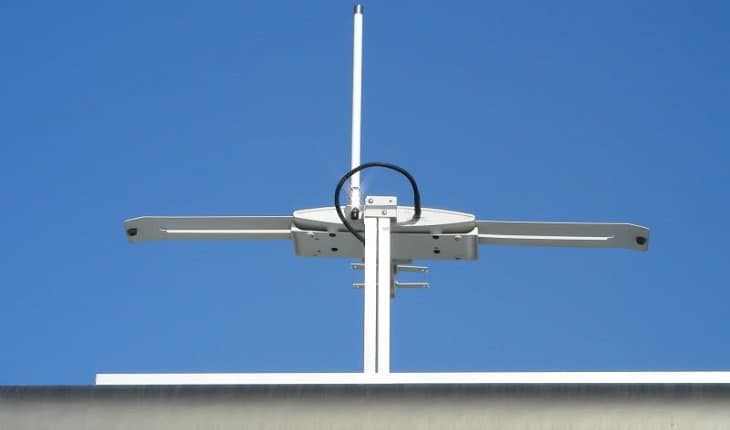 The best ones also have outdoor antennas that further improve the coverage area of a network. They can also let you connect to public WiFi signals in the campground, allowing you to stay connected to the world even when away from home. The best of them also have Ethernet ports that let you connect wired devices for a better speed and reception. Nevertheless, the RV WiFi booster is for you if you’re frequently traveling with your recreational vehicle, when camping and are always on the move but want to stay connected online. Invest on a good quality one by starting the comparison process using our list here. WiFi boosters for a recreational vehicle do not come in many types because they pretty much have the same purpose extending coverage area of an existing WiFi network onboard. At the very least, these boosters work by receiving and then rebroadcasting the signal of your current connection. Then, they amplify or boost the signal before transmitting it so that other devices will receive and take advantage of better speed. With these devices, the signal’s coverage area can be doubled, reaching hard to reach places in your RV, office, backyard or home. They don’t have much difference because they work with the same goal of improving coverage area of the signal of your WiFi. On the other hand, the best models of them can also pick up weak signals in the RV park or camping ground, especially useful if you want to connect to these WiFi signals and access online to do business, browse the web, shop online or simply keep yourself entertained watching movies or videos or listening to music. There are many reasons to have an RV WiFi booster in camping and RVing. As you may already know, using the internet is a part of our lifestyle. Many of us use it for business, shopping, researching and comparing different products to buy, to name some purposes. So even when camping and enjoying the activity, there are certain points when we need to access the when on the go. And if you’re someone who spends most of your time traveling in your recreational vehicle, camper or travel trailer, the use of this RV WiFi booster becomes even more important. Weather updates: When camping, it is important to keep abreast with the weather. It is for safety and convenience purposes. You don’t want to ruin a trip just because you did not know about a storm in the destination you’re going with your family. Checking the weather from time to time and staying updated on it is one of the reasons to invest in a good RV WiFi booster. Having one, you can be certain that you will have an internet access even if you’re miles away from the public WiFi. Locating directions: If it would be your first time to go camping in one campground, you need to locate the right directions on how to get there. If not, you might waste a lot of time in navigating a place and put in so much effort in the process. By having a WiFi extender, you can easily locate the right directions on how to get to a place without the guesswork. So if you’re someone who values your time, money and effort, you should not miss having a WiFi extender onboard when camping. Staying connected with loved ones: When we’re camping, we sometimes don’t have the chance to take all our family members because of their activities and schedule. In this case, we want to stay connected with them through messages and video calls. If you don’t have a good connection online, you might not keep up and communicate with them constantly whenever you want and need to. So if you want to ensure that communication lines will always be open, you must invest on a good RV WiFi booster to help you stay connected with loved ones. 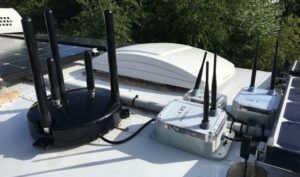 Versatility: The WiFi signal booster is also versatile enough to be used at home and even in boats and marine environments. You can depend on it for internet access throughout a big backyard, home or other places where you need to connect online but also have a strong signal reception. With an extender, you can be certain that current mobile data signal can be repeated or boosted to increase its speed. Some of the best models are also able to function at long ranges, making it possible to connect to public WiFi that is located kilometers away. Doing business: Many of us who have to do work online can rely on a WiFi booster that can help us stay connected and do business on the web. Whether it is about checking emails, having a video conference or a Facetime session with a business partner, you can have peace of mind that the outdoor WiFi extender can aid so that you can achieve the purpose and do business online. Not hard to install – The travel WiFi extender works in only a few steps. You don’t need to follow complicated steps to get started. The best models also come with an easy to follow user manual that help you set up the device in a snap. That is why you have to invest in one that has this easy to set up feature to prevent the stress of following complicated steps. Can boost even weak public WiFi signals – When camping and you have to park your recreational vehicle somewhere far from the WiFi source, you can have peace of mind that the wireless internet extender can locate those weak signals and boost them so that you can have a stable and strong internet connection. For this reason, you should invest on a long-range WiFi signal booster with outdoor antennas for better coverage. Playing media, listening to music, watching movies or simply browsing the web: Online, we can do so many things while traveling aboard our RV and one of those is to keep ourselves entertained with different types of media, including movie, music and so many more. Having a WiFi signal extender, several users can connect and browse online to play media and listen to music, among other things for entertainment. Working on homework: If you have children and you’re going camping on the weekend, there is tendency that they also have to work on homework while traveling. So by having this wireless internet booster onboard, you can help them perform research and do their homework without any hassle. 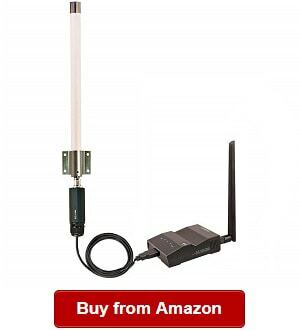 For this reason, you really need to have one of the best WiFi antennas for RVers that we’ve featured today. You shouldn’t buy something without knowing what you’re investing on, so you need to know certain things to look for and consider when shopping around for the best RV WiFi repeater. 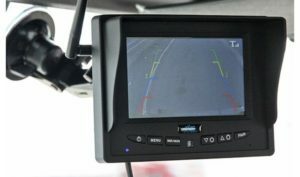 In the following, we’ve listed some things to take note of before you buy this device for your RV. One thing I notice about these signal boosters is that they come in a wide range of designs. Some of them are boosters that come with plastic blocks that you should plug into an outlet immediately to use it. They’re also designed with LED displays that show signal strength. On the other hand, there are also WiFi repeaters that look pretty much like a conventional router, with its power supply. If you’re looking for more features, then I suggest going for those that resemble a router design. Reason is that in the first one, you should still look into its compatibility in the outlet where you have to plug it in, as some of them are quite large and bulky. Note that some of these extenders only have specific type of devices to which they can be compatible. Also, you need to find one that can work well with your current WiFi connection and router. Buying a fancy or feature-rich booster won’t make any sense if that won’t work with your current setup. So before shopping, you should determine if what you’re eyeing on is compatible with your router. We all want to get the most value out of our money, so we also have considered types that make for a good buy. For one, you might want to look for one that comes with an Ethernet port or a few of them. These ports are good when trying to connect wired devices to receive higher speeds while also allowing for multiple devices to connect to the network. It is another important factor to consider when looking for a WiFi repeater. We’re talking about MBPS here. 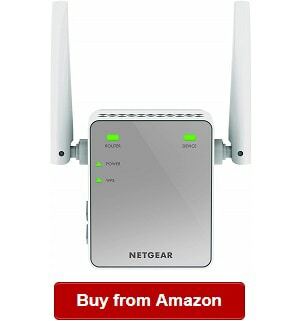 You must buy one that is compatible with the max speed that your current router can support. Do not pick something offering speed beyond what your setup can support. It is not news that internet safety and security should be looked into when shopping around for a booster. You don’t simply buy one that can rebroadcast the signal your current connection is receiving, but it should also ensure of security. When reviewing the top products we have featured here, we’ve also considered the high security standards of the booster to ensure that connecting online even when camping can be safe. The best ones offer an encryption that boost security by preventing someone from connecting to your network without inputting a password. Q: How to use WiFi booster for RV? A: WiFi Repeaters aren’t hard to use or install. In fact, you just have to place it close to your current WiFi network, and then plug it into the power supply. Then, open your PC and then log into the WiFi repeater or extender. From there, you just have to input the current credentials of your network to let the device to connect and then boost the signal. Q: RV WiFi booster vs. regular WiFi booster: what is the difference? A: The main difference lies on the specific application for which each one is designed. For example, the recreational vehicle WiFi repeater or booster is designed and built for on the go operations, covering a large area due to their long-range capabilities. In fact, some of them can find even WiFi signals located miles away. On the other hand, the regular booster might not be as powerful as the recreational vehicle WiFi connection signal extender when it comes to coverage range. For this reason, you should invest on a mobile home WiFi booster if you’re looking for one designed for mobile operations. 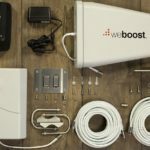 Q: Where to buy WiFi booster for RV? 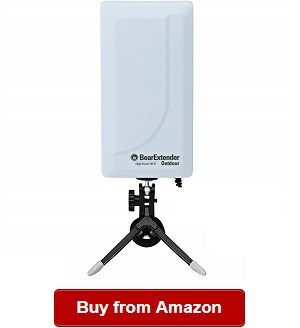 A: You can buy an RV WiFi booster antenna online in places like Amazon. I believe it is the best source of these products for a wide range of choices available versus in a brick-and-mortar store. In this case, you can compare many products at once in one place factoring in the features, price and capabilities, among other things without having to jump from one website to another. When shopping around for a recreational vehicle WiFi extender, repeater or booster, you should consider its compatibility, features and speed supported, among other things we’ve highlighted today. To get started on the comparison and selection process, we do encourage you to begin with the products we have listed above, as they’re the most trusted by the RV community for their long range, speed, additional features and durability. We do hope you picked up valuable information from this guide about the best WiFi booster for RV. Happy shopping! 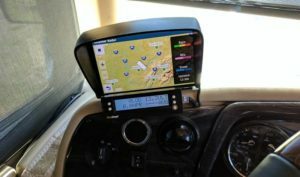 Are you looking for best TVs for RV, best TV antennas for RV, best RV backup cameras, best cell phone boosters for RV, best RV GPS and best RV tire pressure monitoring systems in RV Electronics. We do hope you find them useful! Hello and thanks for the great review! Seems all these solutions simply amplify wifi signals which of course is what we need. However, it would require that we log into our wifi on our phones, tablets, computer and chromecast devices. Is there a solution that allows all our devices to log into the Extender, then set that connection’s password? Hi, Chris, thanks, so sorry I don’t have any idea for this issue. Hope you can find the solution soon. Hi Chris, if I understand your question correctly you may want to look at wifiranger.com and the Sky 3 product. 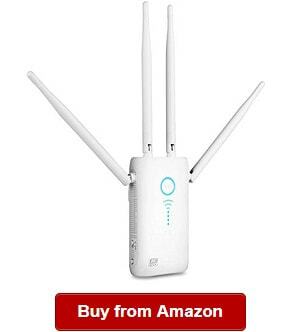 Might I suggest you look at purchasing a wifi hotspot device? I have the Nighthawk M1 (AT & T SIM card on a $ 30 per month unlimited plan). By using the hotspot along with my We Boost, I’m able to log on several devices and have password protection. Also have the capability to allow guests to log on. Thanks for your suggestion on this problem.